Compact (63cm wide and 70cm long) and lightweight (14.3 kg), GF42 can be easily transported and stored in a car trunk. Fire trainer without water, GF42 requires no preparation before use (no water filling, etc.). Compact, lightweight, GF42 fire trainer is easy to carry in a vehicle trunk. Water-free, it is simple and quick to set-up. 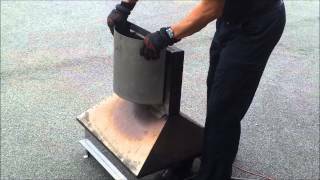 With a fire surface area of 0.42m², it generates flames with a maximum height of 1,20m. 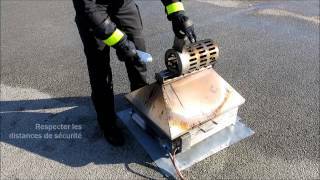 Operation and fire extinguishing demonstration of GF42 fire trainer / flame generator without water! The different modules that can be fixed o n GF42 allow to simulate different fires: deep fryer fire, TV fire, oil explosion, etc. 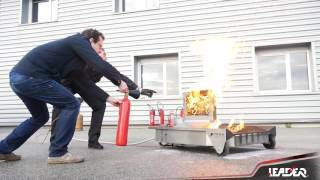 The range of LEADER fire trainers enables companies to train their employees in fire extinguishing safely while respecting the environment. Small size to be easily shipped by car. To connect two bottles of domestic propane gas (with flow limiter) to have a flame height similar to that generated by industrial propane bottles (without flow limiter).